The holidays are fast approaching and I've been wondering where autumn went? I thought it would be fun to share my thanksgiving turkey. Enjoy! 1) Cut Full Heart in half and cut the bottom points off of each half. Round out the sharp corners for the chicken thighs. Cut 3 petals off of the 6 petal flower in Boho Blossoms for feet. 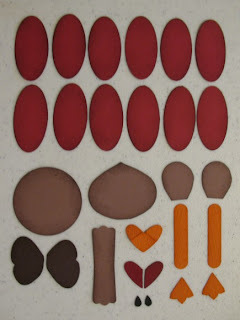 Fold wide heart from Heart to Heart to make the beak (fold rounded top parts down). Cut large heart from Heart to Heart in half for snood and top of head. Cut butterfly in half for wings. 2) Sponge feathers with riding hood red. Sponge body, head and wing pieces with chocolate chip. 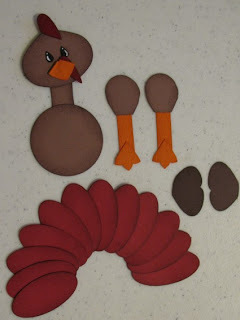 Sponge beak, legs and feet pieces with pumpkin pie. 3) Glue neck onto body. Attach head with dimensional. Glue snood onto back of beak. Attach to face with dimensional. Glue on eyes and add highlights with uni-ball white gel pen. 4) Glue legs onto thighs. Glue on feet. Attach thighs to body with dimensionals. Attach so that the feet are crossed at the ankle. You could position the legs in the splits so that you can make the card smaller in heighth. Attach wings with dimensionals. 5) Arrange ovals in an arc for the tail. Run a line of glue around the inside of the arc and place body over the top to glue in place. Leaf print 5 7/8" x 4"
Polka dot print 5 7/8" x 2"
Very clever Kim, thanks for sharing with us! Your turkey is adorable .thank's for the tutorial. Glad to hear that your daughter is on the mend..cute cute turkey..even though we don't celebrate thanksgiving here in australia still very cute..tfs..
Oh my goodness this is fantastic. Thanks for the inspiration. I am here from the Late night Stamper's (LNS). O.K. This has to be the CUTEST turkey I've ever seen!! I LOVE your creativity and your blog!! Thank you for the ongoing inspiration!! 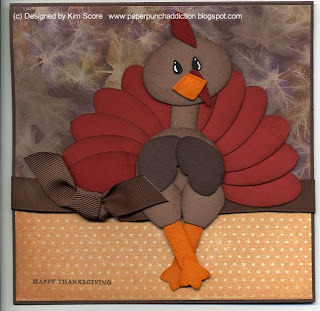 How cute is this turkey!!! I love him! He looks like he is ready to sit down and enjoy Thanksgiving dinner with us! Thanks for sharing! I love, love, LOVE your tutorials! I've purchased all the ones on the left side of the blog, and I think it's totally generous of you to share these free of charge. So very cute! Oh my! Amazing!!! I love it! Oh wow this is just too cute, I was looking for something like this a few days ago. Love it. This is great...thank you for sharing this recipe!